Algae Growth -- Drinking water sometimes tastes musty or grassy during summer months. This is not a health hazard but can be an aesthetic problem. In SPU's system musty or grassy tastes are usually a result of algae blooms that naturally occur during warm weather months in Lake Youngs Reservoir. Disinfection Processes-- Chlorine is used as a disinfectant in the water treatment process. When this chemical reacts with natural organic compounds in the water, by-products that produce a chorine-type odor may be generated. Distribution System -- Taste and odor problems within the distribution system are generally caused by pressure surges in the main water system, or within the home plumbing. Among the causes of pressure disturbances are water main breaks, street construction or the use of fire fighting connections. The most common cause of pressure changes in home plumbing systems is the corrosion of galvanized plumbing systems. This situation is usually indicated by yellow or reddish water, and appears in the first water drawn from the faucet each day. You can temporarily remedy this problem by flushing your house’s pipes of standing water (remember to conserve -- collect the water and use it for other purposes like watering plants or doing dishes). What is Seattle Public Utilities doing to minimize T&O occurrences? SPU closely monitors all taste and odor problems reported in addition to performing flavor profile analyses on a regular basis. 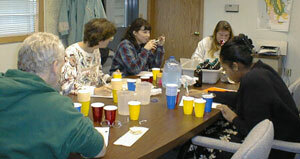 Flavor profile analysis uses a group of trained panelists to identify flavors and/or aromas in raw and treated waters. Seattle Public Utilities has recognized an algal caused taste and odor problem and has initiated several studies to control the problem. An ozonation plant at the Lake Youngs outlet is scheduled to go on line in 2004; this treatment process has demonstrated 100% effectiveness in pilot scale testing for removing taste and odor problems associated with algal growth. What can be done at home to reduce T&O ? Current taste and odor problems can be reduced at home by adding a drop or two of lemon to a glass or pitcher of water and/or chilling the water before drinking. If aesthetics continue to be a problem, you can consider a home filter. Who should I call if I experience T&O? Whenever your think your water has an unusual taste or odor, call the Highline Water District Office at (206) 824-0375 and speak to Mike Becker, our Water Quality Coordinator at ext. 111.